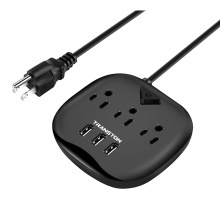 3 USB, 3 Standard Ports Power Strip, meet your need. With total control switch, safer and more convenient. Plug and play, easy to carry, perfect for travel and business. High quality 1.5m cord, anti-slip rubber footpad. LED indicator, independent safety door. Item color may sight aberration due to different shooting light and monitor display.